I must have been four or five when I first visited the city of Mumbai.Mumbai or Bombay as it was called then, was something more than I had seen or dreamt of. Before visiting Mumbai, I had never seen a beach Or the Planetarium. I had never seen a city so crowded. And I had never eaten Shrikhand before that. I remember like yesterday when my mother and I had spent a couple I'd days in my grand aunt's house. She was my mother's paternal aunt. She was a talented and an enterprising woman who loved to create. She was a fabulous cook and had a penchant for arts and crafts. It was in her house that I first tasted Shrikhand and instantly fallen in love with it. The Shrikhand she had served was yellow, thick, creamy, and had a custard like consistency. The combination of tart and sweet flavors bowled me over completely. 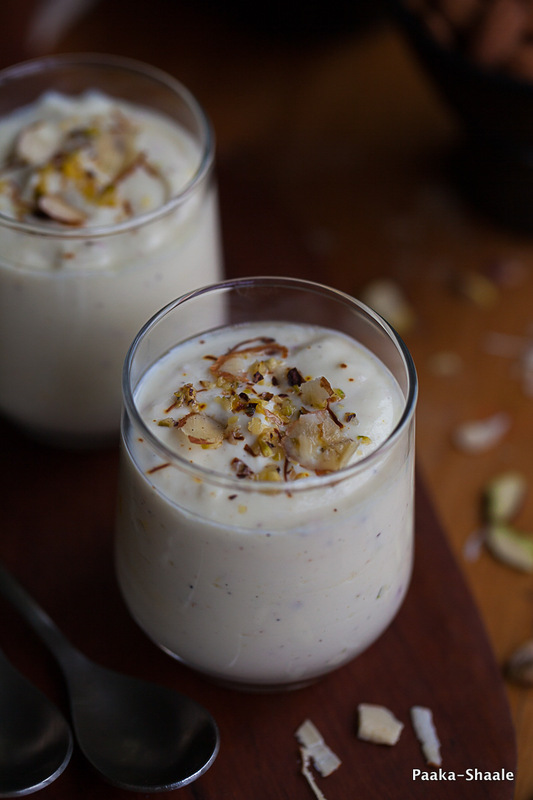 From that moment on, I Shrikhand became a favourite dessert of mine. I used to buy Amul shrikhand from time to time lick away the creamy goodness. It was only a few back that u actually thought of making it myself. 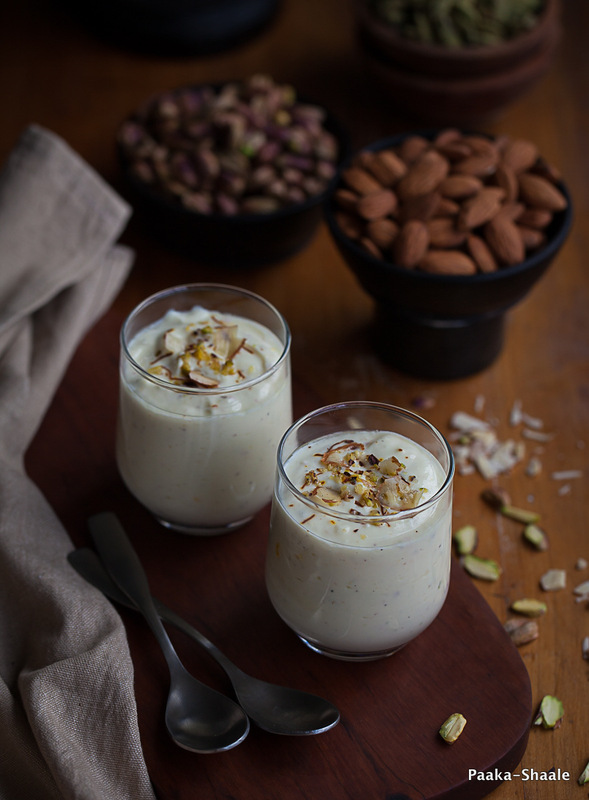 The process of making Shrikhand can be a little time consuming but very simple. 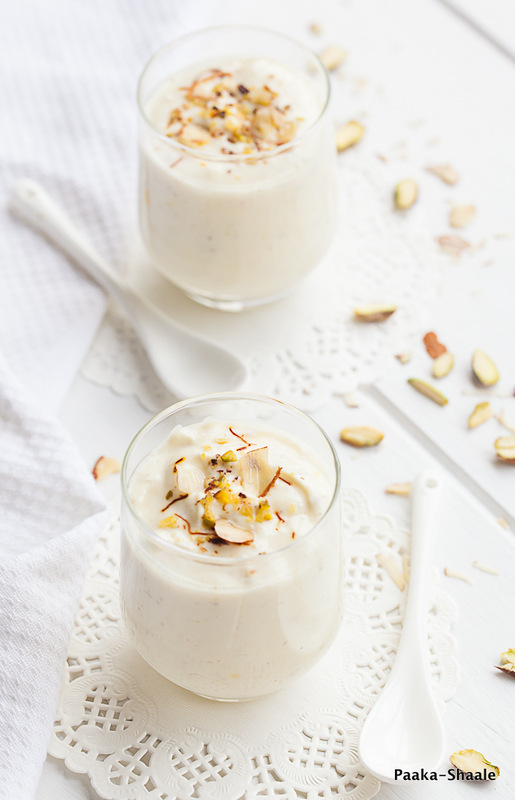 All you need is a large quantity of thick yogurt, sugar and a piece of clean muslin cloth or a fine sieve and a few hors of refrigeration and shrikhand will be ready. It might seem like a long and tedious ordeal but this creamy dessert is worth all time and effort. 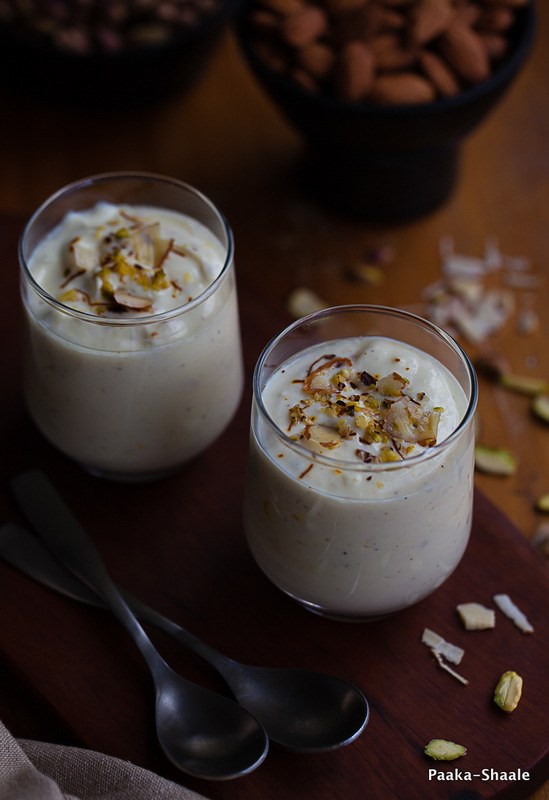 Since Navratilova is on, this dessert will be perfect for the festivities. You can serve this as a desert or as a side dish along with puri. Wishing you all a very happy Navratilova!!! Take a cloth that has been chosen for the purpose of straining. You can use a white teeshirt, a tea towel or a cheese cloth. Stretch the cloth over the top of the bowl and secure the edges with rubber bands or a thread around the outside of the bowl. Pour the yogurt onto the strainer and place the bowl along with the suspended yogurt in the fridge. Allow the yogurt to drain for 3 to 6hrs or overnight. Alternatively a fine sleeve can be used for this purpose. Transfer the drained yogurt to a bowl. Add the sugar, soaked saffron, cardamom powder and mix gently with a balloon whisk. Stir in the chopped pistachios and slivered almonds and chill for an hour or so before serving. 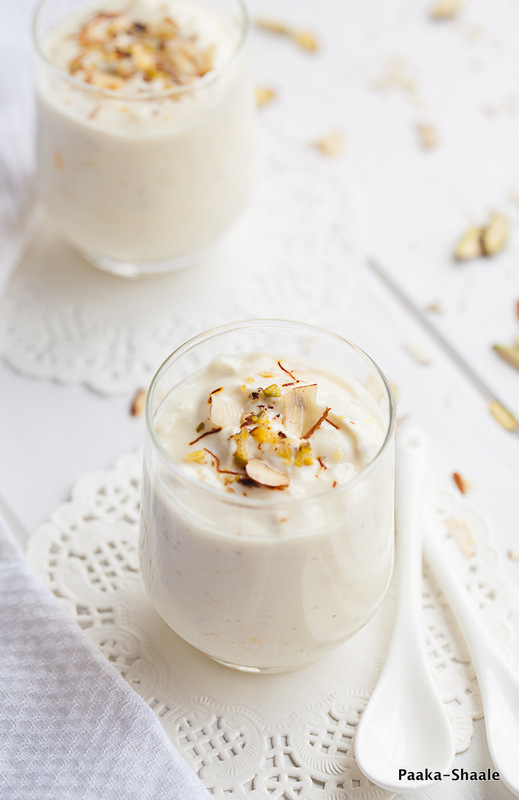 Ready to use Greek yogurt can be used to make shrikhand. But it will lack the characterstic tart flavor that home made yogurt has. You can add some fruit puree or berries to give this dessert an exotic flavor. I have a similar story, my mother is from Mumbai and I remember as a kid of 5 or 6 tasting shrikhand for the first time and but here is the difference I did not not like it at all, till I became an adult…now I can wipe off that entire serving and more. Looks fabulous and oh so creamy.